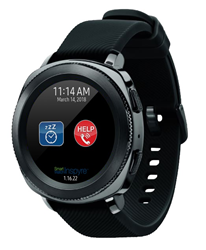 Smart Monitor, the leading provider of clinically validated solutions for the management of complex chronic conditions, today announced the release of SmartWatch Inspyre™ for Samsung Gear wearable devices. The Inspyre application works in concert with smartphones and the Smart Monitor cloud-based platform - designed to enhance the safety of patients, alert loved ones, and empower clinicians with actionable intelligence. SmartWatch Inspyre does this through an intuitive application tailored for Samsung Gear devices. Highly advanced algorithms recognize a wearer’s movement pattern indicating repetitive shaking movements, similar to those caused by convulsive seizures. Family members and caregivers are alerted upon onset of these movement patterns so they can intervene in a timely manner to maximize safety of their loved one. The episodic data is captured in a secure HIPAA-compliant cloud for review, analysis, and care planning by appropriate healthcare professionals. The solution has been available on various wearable device platforms since 2013 and has proven to be an effective tool in caring for those with epilepsy and similar conditions. The availability of SmartWatch Inspyre for Samsung Gear smart watches, and the sleek and lightweight Gear Fit band, further extends the ability for this solution to have a positive impact on patient care. Smart Monitor is a fast-growing digital health company based in the Silicon Valley, CA. It specializes in chronic disease management solutions that integrate patient-generated health data, mobile and cloud technologies, and AI-based analytics in a seamless digital environment. Smart Monitor’s patent-protected solutions enhance autonomy, privacy, and safety for those with chronic health conditions while enabling care providers and loved ones to provide timely and meaningful interventions.